One of the Netherlands’ many talented typography masters (based in Leiden), SCAGE is known for his strange letter styles, and prolific bombing through out the country. SCAGE began his career in 1988 influenced by two legendary writers from his hometown Leiden named ZEDZ and DAYS. In the early days SCAGE garnered a degree of fame by focusing on strategically bombing the Dutch railwaytracks and by painting ‘keetjes’, working man cabins on wheels which moved throughout the city. SCAGE began a five-year program in 1993 at the Royal Academie of Arts in The Hague, studying Graphic Design & Typography. Bored by the bombing life, which he felt drained his energy and creativity, he focused on developing his own style and language within the graffiti spectrum. He started experimenting with the fusion of graffiti, graphic design and print. Today he is an art director at a design agency in Amsterdam, combining his work with painting canvases and graffiti murals. 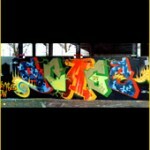 Visit this link for an interview with Scage.